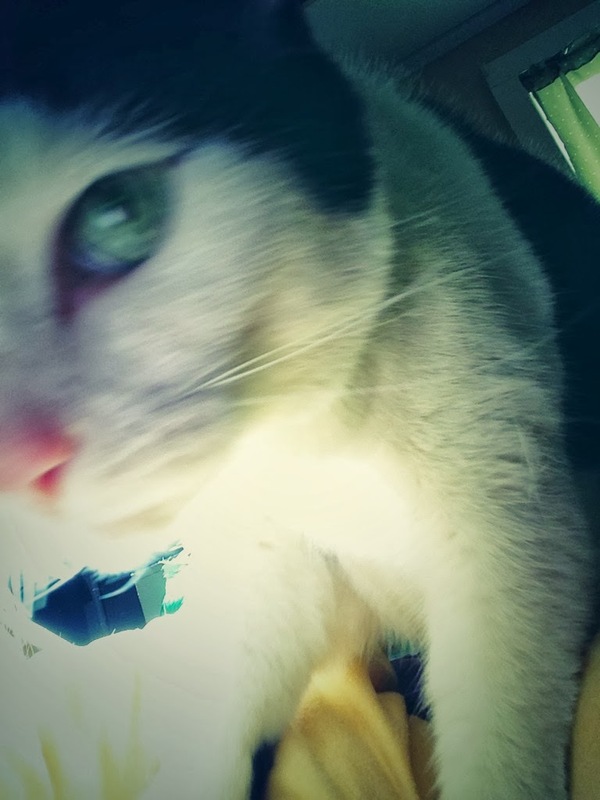 LUMUHAND: Meet the Fur Babies..Right Meow. I'm a certifiable cat lady. A cat's purr is one of my favorite sounds in the world, and I love nothing more than a sweet, cuddly kitty. The cat rooms at the Humane Society are my kryptonite (I avoid them like the plague) I feed stray ones (I know I shouldn't...but they look so hungry...and sad...and hungry) and I have to fight the urge, all the time, to not be that chick from the Animaniacs cartoon that practically strangles them with her overwhelming love (and desire) to cuddle them. So, without further adieu, I'd like to introduce you to my 17 pound ball of fluff. She's a Hemingway Polydactyl, which is basically a fancier name for a domestic shorthair who also happens to be a mutant. The author, Nathaniel Hemingway, has loads of these cats running around his place, hence the name preceding Polydactyl. Her birth defect results in extra toes, hers make her paws appear like mittens. She's a pretty rad cad - I mean she has thumbs. She also will sit on command for Cheese (a pretty fun trick to show-off) and her favorite toy is a little squirrel, which is funny since my sorority (Alpha Gamma Delta) mascot was the squirrel. Up until 2 years ago, I had ZERO interest in becoming a dog owner. Times have changed - Enter Pippa the Pomeranian. Fast forward two days. BFF’s mom is now suggesting we visit this dog at the shelter. She has taken to emailing the shelter on my behalf and even puts the pup on hold so I could see her. (And to think that I thought cat ladies were crazy…) Under the ruse of a lunch date, I was practically coerced on this group shelter trip. I mean,. I was a certifiable cat lady. Cats were self-sufficient – Feed, pet, poop scoop, pet, poop scoop. Repeat. Visiting the animal shelter for a dog wasn’t exactly on my life agenda. Ever. 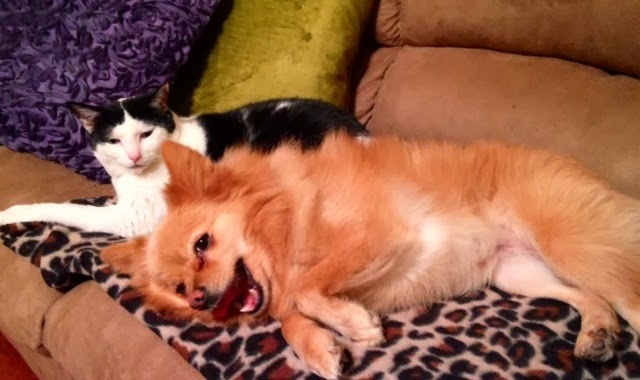 You might be wondering how the 10 year-old cat feels about the 3-year old dog... Well... This picture speaks for itself. It's a relationship of tolerance. Tiptoe is not the biggest fan.. and Pippa hasn't quite caught on to this. Ignorance is bliss. 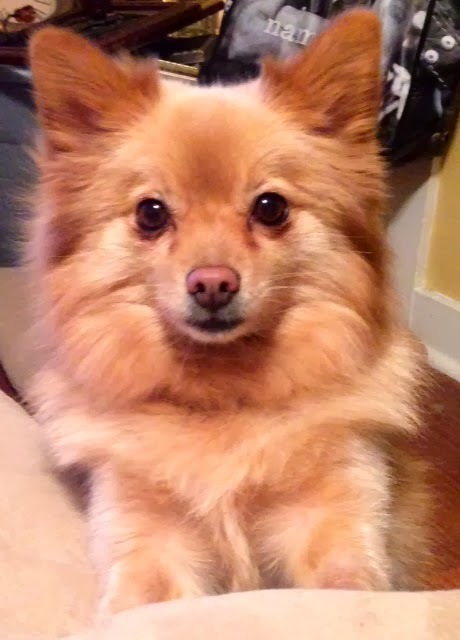 I have a Pom back home!!! I got Sierra in college. Sadly when I got sick and moved home for a year, she adjusted too well. When I took her back, she peed and pooped everywhere, ate everything in sight, etc. When I'd visit my parents, she was an angel. It was hard but I left her with them. I miss her so much. But now I hvpave two huge pups I'm obsessed with. And to be honest, I'm a big dog fan lol. But DEFINITELY a crazy dog lady lol. Crazy pet parents are awesome!!!! Your weim's are PRECIOUS.. the Instagram pic of one of them on your island had me rolling. I can imagine that they are A LOT of fun! What color is Sierra? Was she spastic? LOL.. Pippa is a total spazz.. and very protective/obsessed with me/won't pee outside when it rains or snows, etc. I hear this is pretty stereotypical of Poms. Preferable I'm a crazy cat lady - but, we can totally be friends. 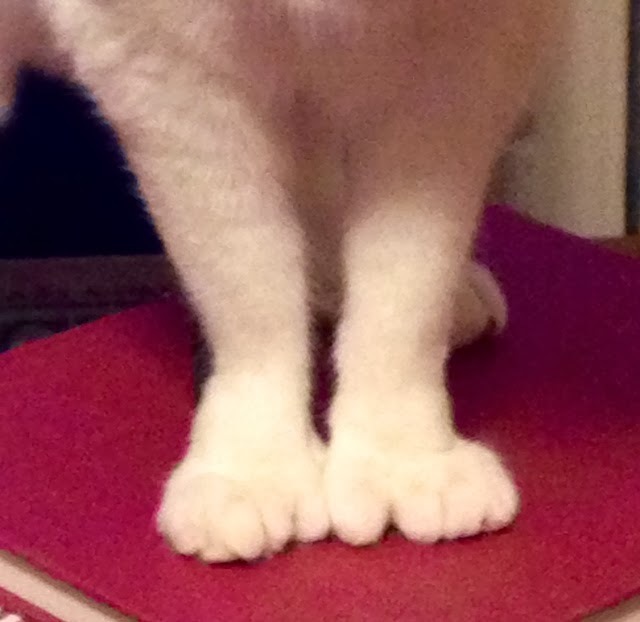 Rach, your pets are adorable; but your cat's toes kind of freak me out. Mama.. thanks for complimenting my fur babies.. I know Tippy's toes are freaky... she has quite the dexterity.. If you ever meet her, you all can thumb wrestle. BUT WHICH THUMB! She has an advantage. Your furbabies are equally as cute. Looking forward to more posts in the future! I am a fan of all things anchors, so that goes for anyone who loves anchors too. Thank you for 'dropping anchor' on my blog and for your sweet compliments!! You've made my day.